"The unmanned Chang'e 3 probe landed in the lunar crater Sinus Iridum, making China the third country after the United States and Russia to have reached the Moon. ... This success on the part of China, which with its space program seeks to show that it can compete with the traditional technological powers after decades of under-development and global isolation, occurs ten years after the Asian country launched its first astronaut into space, Yang Liwei." Chang'e, Taoist goddess of the Moon, finally has some company from the home country. An image recorded last Saturday (Dec. 14) by China's Chang'e 3 probe shows the surface of the Moon just moments before landing. Along with Russia and the United States, China has become the third country to land a spacecraft on the Moon. 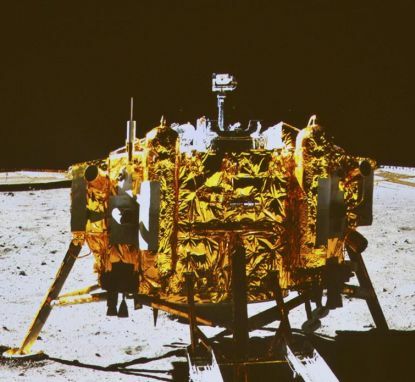 The unmanned Chang'e 3 probe landed in the lunar crater Sinus Iridum, making China the third country after the United States and Russia to have reached the Moon. The Chinese craft managed the first controlled landing since 1976, when the Luna 24 probe, of the extinct Soviet Union, touched down on the lunar surface. The Chang'e 3, launched from the Xichang Satellite Launch Center on December 2nd, orbiting the Moon at a speed of 1.06 miles per second, began to decelerate just over nine miles from the lunar surface, successfully landing at 11:12am local time here in Brasilia. The maneuver, broadcast live by several of China's state-run channels, lasted about 12 minutes. During this time, the spacecraft descended in a parabolic trajectory until it was about 320 feet from the Moon's surface, at which point it leveled off and landed smoothly, hardly raising any lunar dust at all. 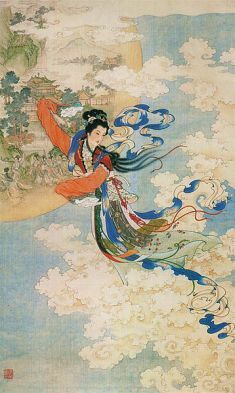 During its approach to the Moon, Chang'e 3 (named after a goddess of Chinese mythology who lives on the Moon) offered very clear images of the Moon's surface, aided by the absence of atmosphere and from Earth satellite's illuminated face. Houston: Among the large headlines concerning Apollo this morning, there's one asking that you watch for a lovely girl with a big rabbit. An ancient legend says a beautiful Chinese girl called Chang-o has been living there for 4,000 years. It seems she was banished to the Moon because she stole the pill of immortality from her husband. You might also look for her companion, a large Chinese rabbit, who is easy to spot since he is always standing on his hind feet in the shade of a cinnamon tree. The name of the rabbit is not reported. Those in charge of the China's space program chose the yet-to-be explored Sinus Iridum crater due to its flat surface, which will facilitate the development of communications and the receipt of sunlight for the batteries on the mobile space robot Yutu. Within hours, the robot was released to the lunar surface to carry out research and geological excavations. To date - 40 years ago - only the Soviet Union has succeeded in positioning mobile robots on the Moon. So China has managed the first extraterrestrial landing in its history. Earlier, in 2007, the country launched its first lunar probe, Chang'e 1, and three years later its second, Chang'e 2. The Asian country intends to send astronauts into Moon orbit by 2020, when China also hopes to have a permanent base orbiting the Earth. Before that, in 2015, the country plans to send a fourth lunar probe, and in 2017, another with the mission of being the first to return to Earth. The United States remains the only country capable of sending astronauts to the Moon: the first time in July, 1969 (Apollo 11), and most recently in December 1972, with the 17th and last mission of the Apollo program. In the 1980s, Washington and Moscow completely abandoned lunar flights, and although they began again in 1990, the decade in which Japan joined the race for lunar exploration, none of the probes sent since then have carried out soft landings - landing only with impact on the Moon. This success on the part of China, which with its space program seeks to show that it can compete with the traditional technological powers after decades of under-development and global isolation, occurs ten years after the Asian country launched its first astronaut into space, Yang Liwei.